it is always better to build castles than houses of cards. 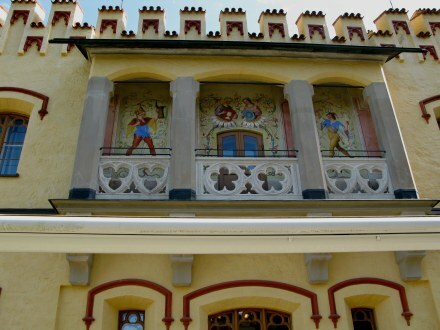 Hohenschwangau Castle is certainly not a house of cards. 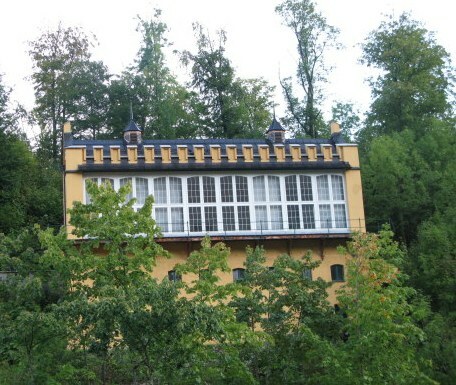 This castle was created as a dream palace, but it is a dream that has endured. Although many people today look upon the extravagant buildings, decorations and furnishings of the castles of the past as something frivolous, they should instead be considered in the context of the times. In fact, the past castle-building of kings was an important contributor to the economy of a nation. 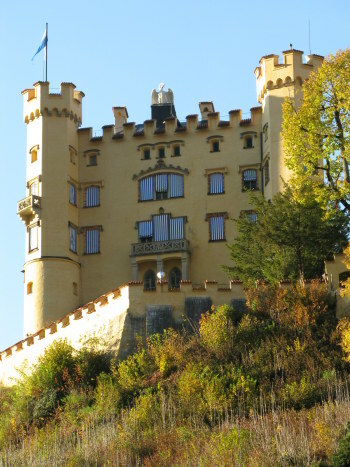 Hohenschwangau Castle is a perfect example. It is in a mountain region and it created new markets for building materials, talent, brawn, and the ability to feed and house the many workers employed in first building, and then operating the structure. It also needed to operate as home to royalty and their children, and as a site for entertainment of their friends, family, peers and for diplomatic envoys. 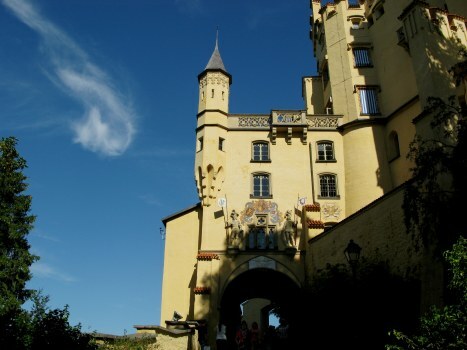 Castles such as Hohenschwangau created ongoing employment for generations of craftsmen. While there were affairs of state to attend to indeed – there was still time for dreaming. In the days of the great courts of Europe, these dreams were translated into tangible form by the artists and architects of the day. 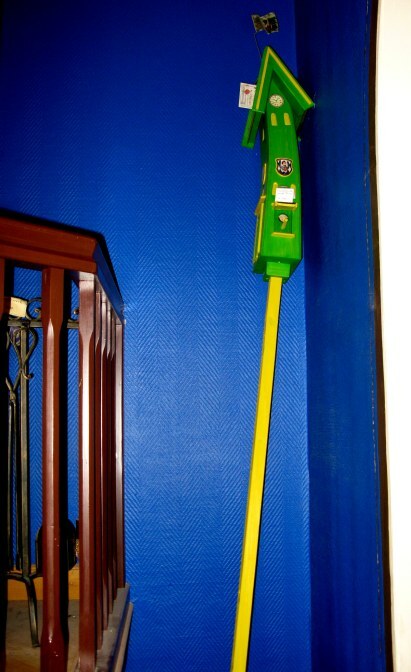 The results are truly marvels when you consider the mechanisms available to the craftsmen and the level of physical labour and creative engineering genius required. 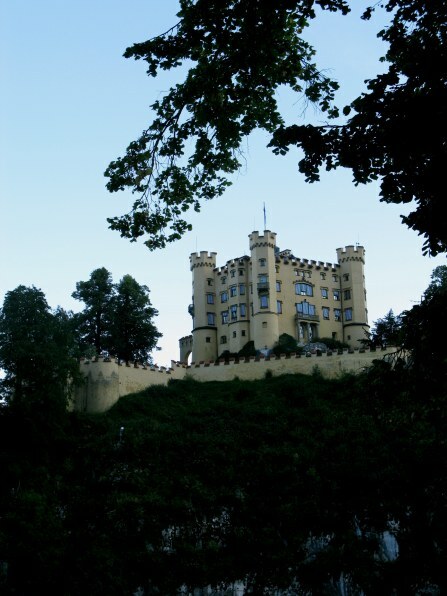 Hohenschwangau Castle reflects the legacy of the parents and grand-parents of Ludwig II, the famous and apparently much-misunderstood King of Bavaria – creator of one of the most famous castles in the world: Neuschwanstein. These castle-builders were arts benefactors as well as rulers. 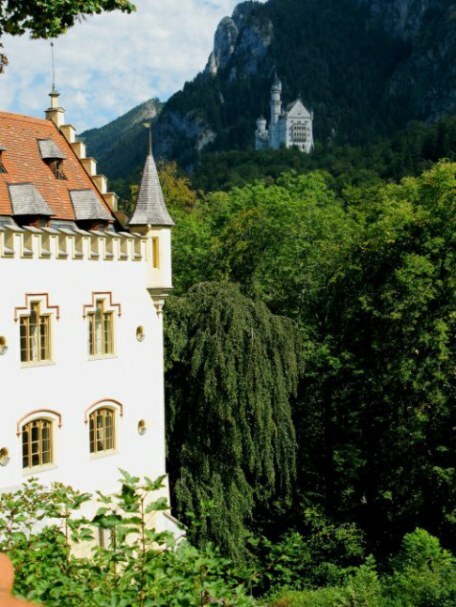 The castle interiors of both Hohenschwanstein and Neuschwanstein are unable to be photographed, but are well worth the tour – and Hohenschwanstein Castle is an equal competitor with Neuschwanstein for its level of art, and its fascination. 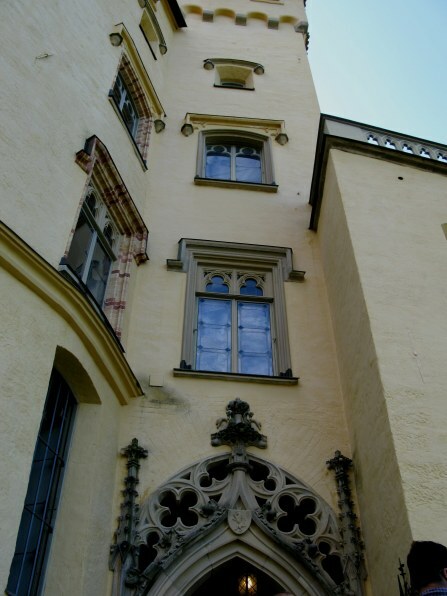 From the window of Hohenschwangau Castle, the newly crowned King Ludwig II could watch the building of Neuschwanstein through a telescope - a telescope that remains in place within Hohenschwangau, still. talking with men of other centuries. I couldn’t help thinking how true this is as I toured the two castles. As with seeing the living spaces of those we know, we gain an insight into the people who inhabit them through the mementos of their life and the way they have them arranged – giving clues to their thinking, their interests and their passions. 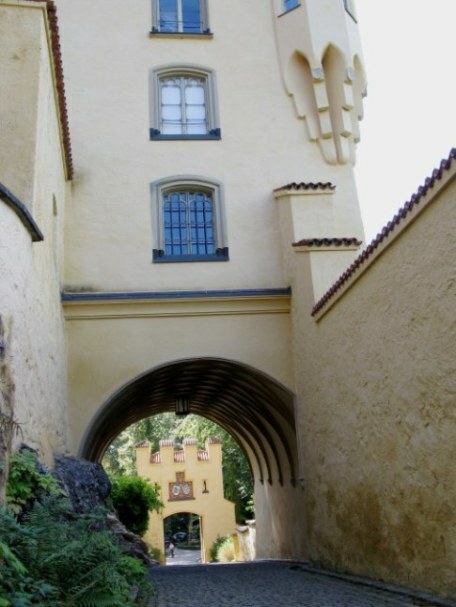 Many find the interior of Maximilian’s castle even more appealing of that of the more famous castle of his son, Ludwig. 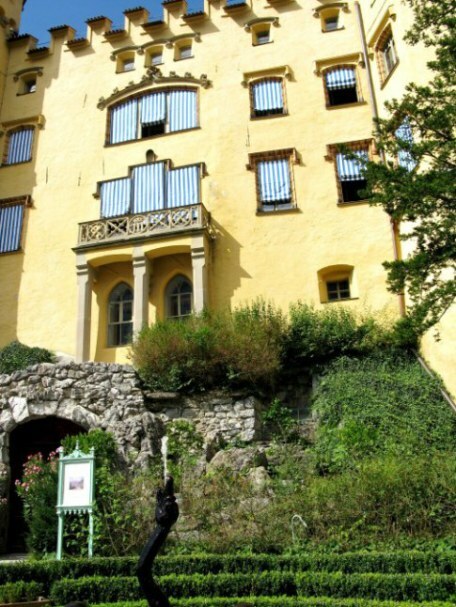 It was at Hohenschwangau Castle that Crown Prince Ludwig and his brother Otto spent holiday periods in respite from strict military education - under which Ludwig was to complete eight years of education in five, under a grueling regimen. Within the castle, imagery from the German Arthurian legends decorates walls, forms themes around which whole rooms are designed, and can be seen in the smallest details, creating a sort of magical kingdom for all who visit – and merely indicated from outside. This romantic design had a direct and long-lasting impact on the young Crown Prince during his childhood visits and in later life, inspiring his own great castle-building fantasies, of which Neuschwanstein is the most famous. Here is some music of Wagner’s ‘Lohengrin’, the Swan Knight - to enjoy as you read. Lohengrin, the Swan Knight was an ancient story made real in Wagner’s Opera of the same name. In the legend, Lohengrin is a protector of the Grail, sent in a boat pulled by swans to recue the maiden Elsa. To understand why it so inspired Ludwig as a young Crown Prince of Bavaria, listen while you read - to this performance of Elsa’s Procession to the Cathedral – which has inspired so many as the `Wedding March’ most familiar to us. 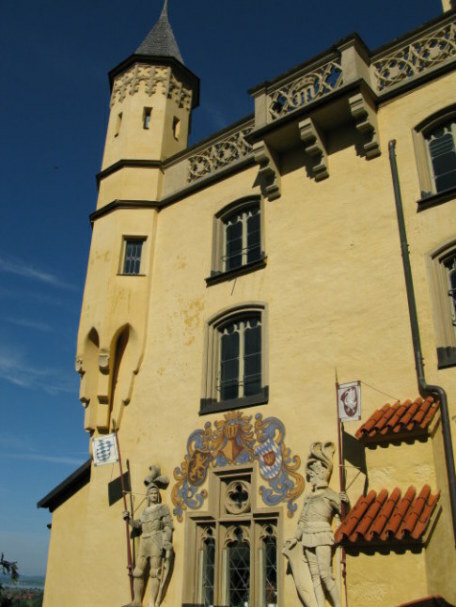 Appropriately for a castle celebrating the famous Swan Knights, Hohenschwangau Castle has gigantic knights above the romantic carriage entrance to the castle. On the day we enjoyed our visit to this wonderful castle, this cloud seemed to be forming the beginning of an upside down apostrophe beside it as we departed. 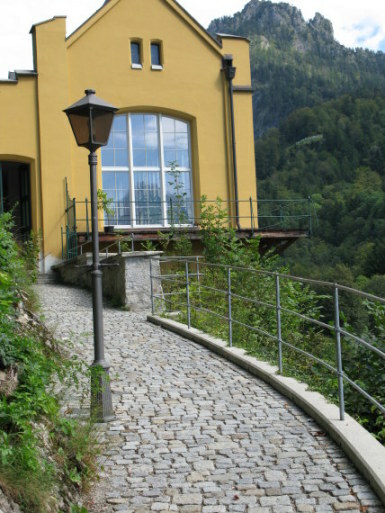 If you come on foot up the stone stairs there is a more imposing view, though neither Hohenschwangau Castle nor Neuschwanstein were designed as fortifications. 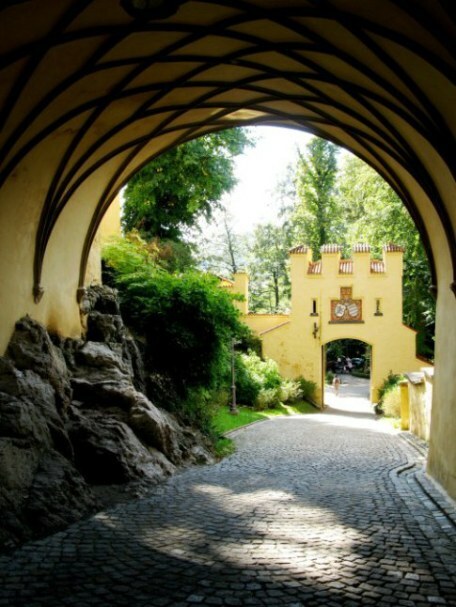 The garden of Hohenschwangau Castle was designed by the theatre architect Domenico Quaglio. 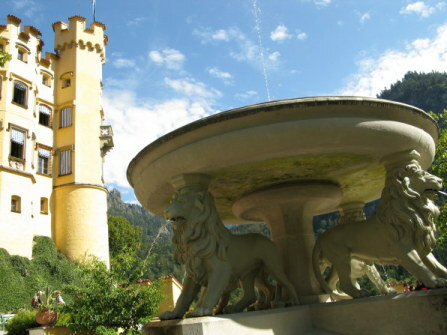 Its water features include of course – in keeping with the name of the castle and of the small hamlet of Hohenschwangau beneath meaning ‘High country of the Swans’ – a swan fountain. 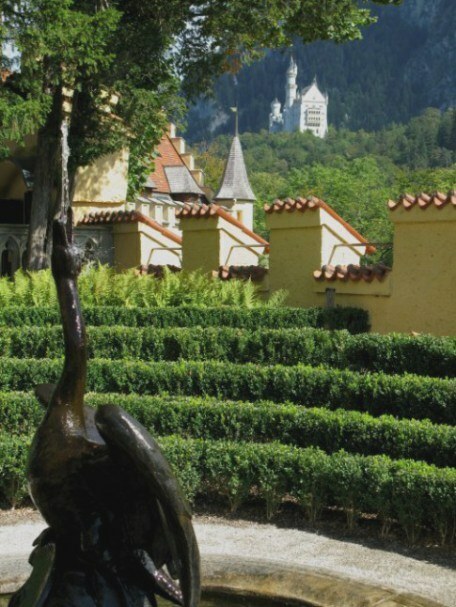 The swan has a lovely view of Neuschwanstein, if he would only turn around!. 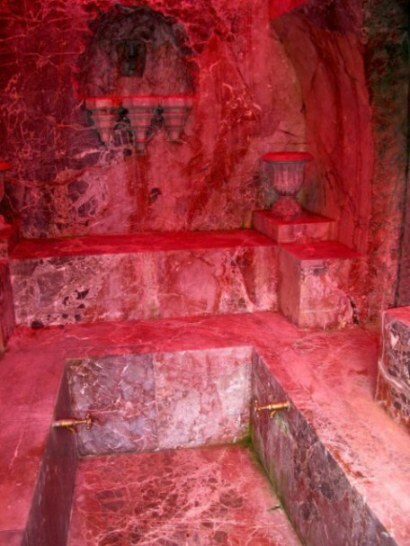 There is a red granite bath-house in the grotto, carved directly from the mountain and highly polished. 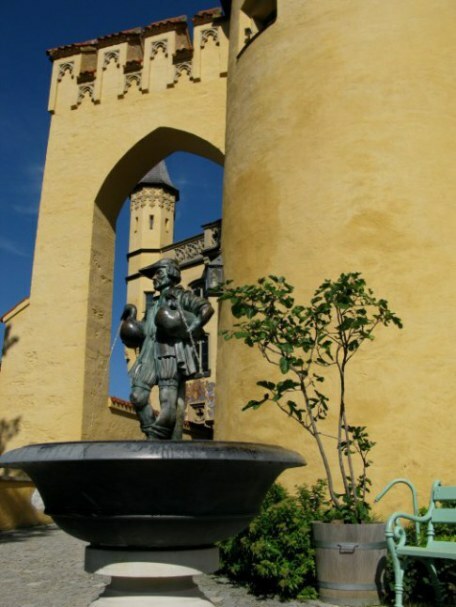 Across the courtyard is the ‘Fountain of the Little Gooseman’. The woodcarver Hans Peisser apparently created the original sculpture on which the bronze was modelled from sketches for such a fountain made around 1500 by Albrecht Dürer. 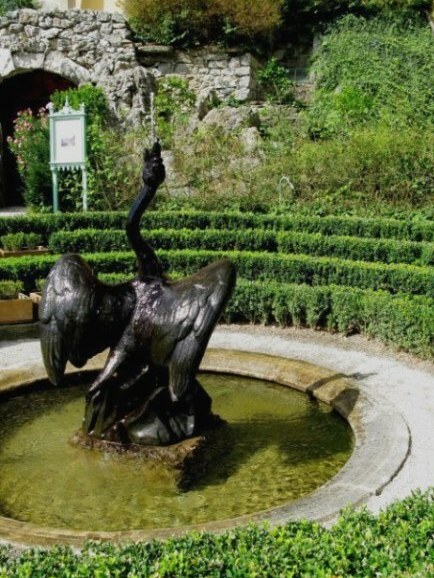 The original Gooseman Fountain is in Nurnberg and is generally attributed to the artist Pankraz Labenwolf and dated between 1550-60. Labenwolf worked in the studios of the Peter Vischers – first in those of the elder, famous for his creation of the 'Sebaldus Grab', the tomb of St. Sebald, patron saint of Nuremberg, and then later, those of the younger. The story goes that the Gooseman used to take his geese to town, sell them, drink the proceeds, and return home empty-handed but in good cheer – and some have added that he developed such a thirst that he drank from the beaks of his geese. The image of the famous Gänsemännchen Fountain in Nuremberg is familiar to beer stein collectors, as those with it on the face of the of a stein are much sought after. 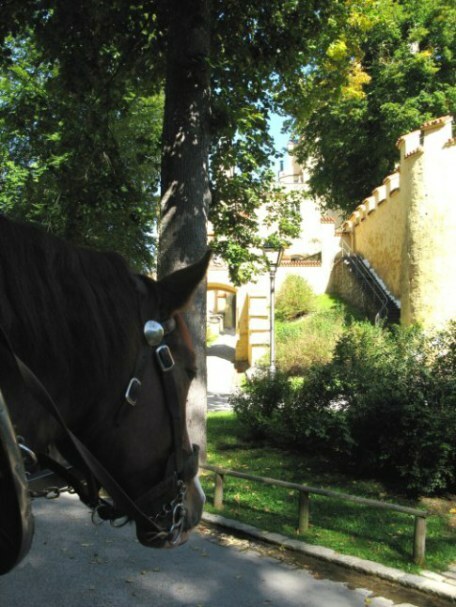 It is here reproduced in the gardens of Hohenschwangau Castle. 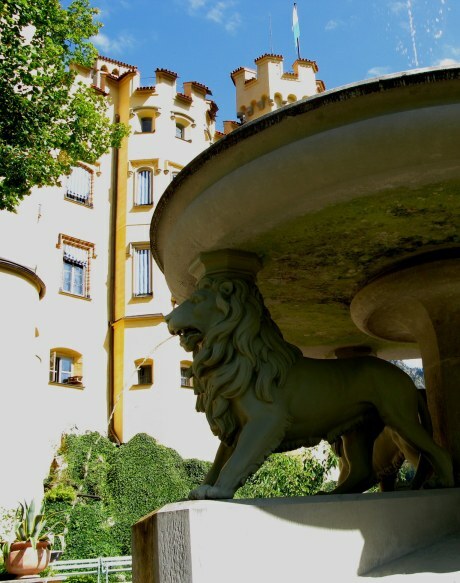 There is also a Lion Fountain that was inspired by the Palace of the Lions in the Spanish Alhambra. Four lions support a central basin. 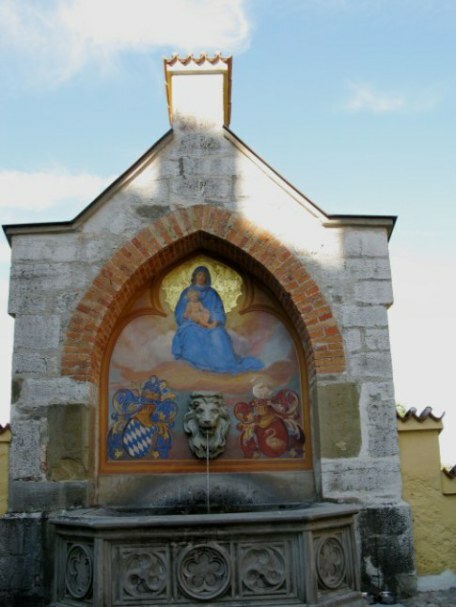 There is also a lovely fountain in the courtyard of Hohenschwangau with the Holy Mother holding the baby Jesus on her lap. Beneath the holy images are two shields reflecting – in blue and white, Bavaria – and in red, the Swan King – and in modern days, with two water bowls for canine visitors escorting their masters or mistresses to the castle, though dogs are not permitted within. It seemed that on a still, blue day in September, the few clouds in the sky were participating in the magic of the two wonderful fairytale castles of Neuschwanstein and Hohenschwangau. 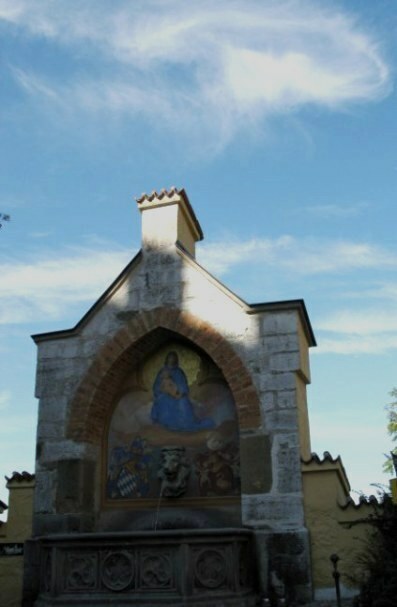 Here, one wisp of cloud formed itself into a very temporal halo above the Holy Mother holding the infant Jesus. The bell tolled for mass, still celebrated in what was apparently the former drinking hall, later converted to the royal chapel. Perched further along the pathway on the cliff face, it is probably better suited to its original purpose. 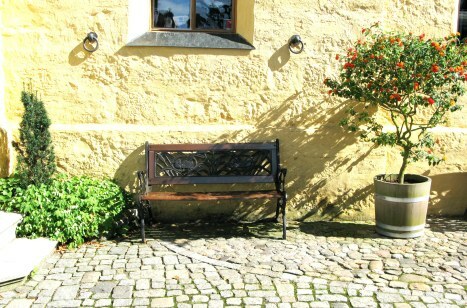 Outside the Hohenschwangau Castle gift shop, even the seat is artistic. Above it there is a colourful mural on the balcony. 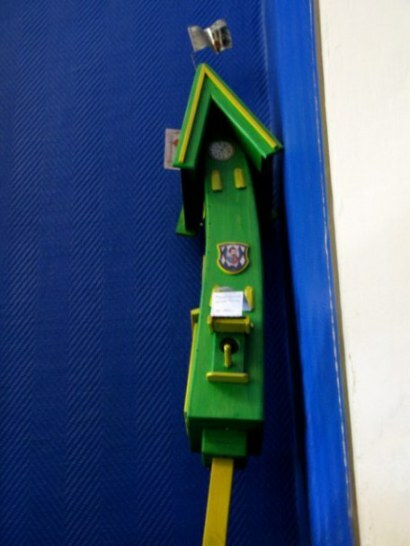 Inside, and standing slightly apart from all the sorts of gifts one would expect of a castle gift shop representing both Hohenschwangau and Neuschwanstein castles, there was this marvelous royal birdhouse with intentionally curved yellow stand. It even sported the royal shield. When you join the dreams of the Kings of Bavaria as they brought legend to life with lavish art – in sculpture, in architecture, in interiors that recreated mythical scenes – the imagery remains with you. It stays etched into your soul as a moment in time when the world seemed as it was in the storybooks of our childhood. PLaces that achieve this always leave our hearts happy that we have their imagery etched into our memories, for bonded with those from our childhood fairy stories, they are inerasable. Appropriately at the end of the story, our carriage awaited. 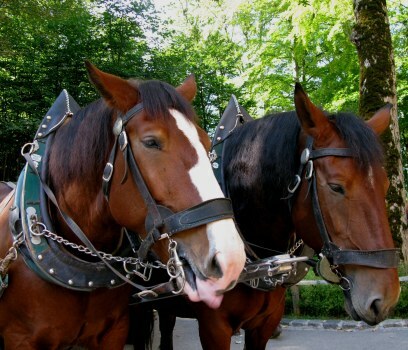 The horses rested quietly in the shade. 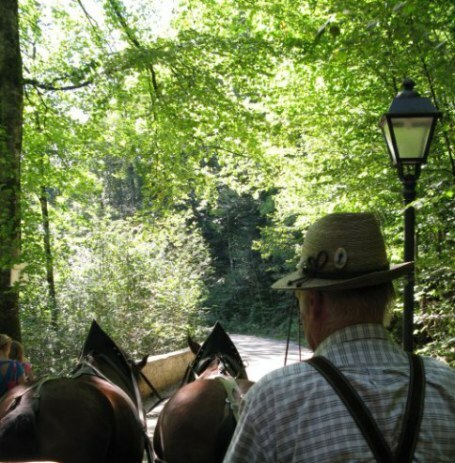 The coach driver, in Bavarian hat and lederhosen (leather pants) greeted the other passengers. 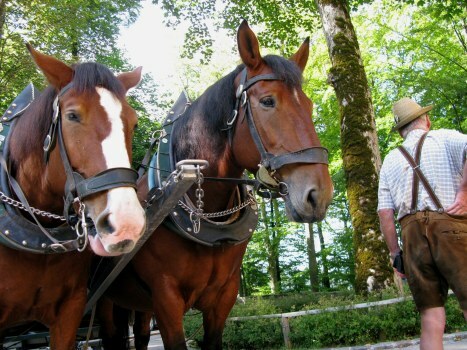 The clip clop of the horses hooves punctuated the still afternoon quietness on our return through the woods to the base of Hohenschwangau Castle. 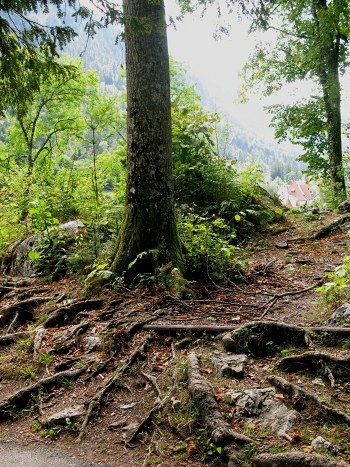 Along the route ancient roots gripped the mountainside. From the track we had momentary glimpses of the boathouse on the Alpsee below. Here, the beauty of nature is set out like a picture book, with magical castles on high mountains and fairy stories to match – telling of hopes and dreams – of reality and schemes. 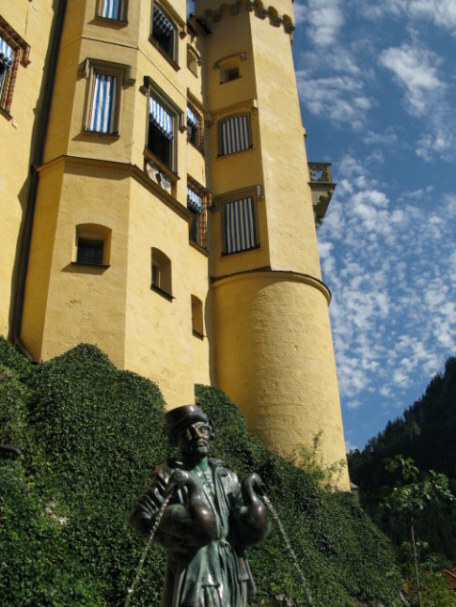 Ludwig would never know how many people would share his dream of magical lands and fairy castles, born here at Hohenschwangau Castle.